After serving in World War II, Producing Artistic Director Bill Yates Sr. attended the Philadelphia Conservatory of Music and The Julliard School of Music in New York City. He teamed up with his wife Peggy, the company's general manager, and they began their careers as performers. 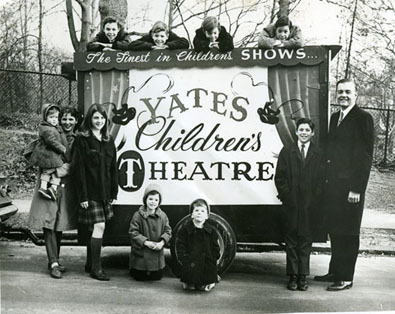 As their family grew they looked for performing alternatives and so started their journey of performing for children. Little did they know at the time it would become their life's passion. With nine children of their own, they have passed their rich theatrical heritage on to their children, grandchildren and to the countless Broadway, Off-Broadway, Television and Film actors who have worked with them and seen them perform over the years. Home | Casting Calls | E-mail us!